This collection of short stories follows a number of Slayers over the years, from ancient Greece to Florida in the '50s. It's a fascinating look into the lives (and some deaths) of a wide variety of women who came before Buffy. A good read, but kind of depressing. Buffy book gift package from my beautiful friend Kay. i actually really liked this, so good. I've really enjoyed the short stories of other slayers. There was a Watcher named Ethan Bentley, and I got a kick out of that. I sort of wanted to find a timeline that showed all the slayers over the years and what parts of the globe they came from, but the sites I found listed stuff like how they died and that will ruin the endings of all the stories in volumes 2-4 if I decide to get them. I liked all of the short stories in this collection, although some of the characters were difficult to like. I thought it was interesting that a lot of the stories centered around big historical events and reinterpreted them to fit the Slayer mythology. I would definitely recommend this collection to fans of the show, and I know I'll end up reading the other volumes in the series. I usually don't read the graphic novels for Buffy or Angel however these caught my eye. 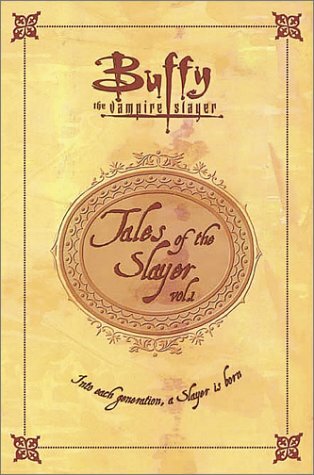 These tell the tales of the slayers, not necessarily Buffy herself. Even though you may not know this slayer, you get into each story none the less. The slayers of the past as well as the slayers of the future (after Buffy). it keeps with the Slayer mythology and fans of Buffy will enjoy it. I love the television series Buffy the Vampire Slayer but I'm not big into all the comics or branch off novels. I've tried, but to no avail. This book though was way fun. I loved to learn about the other slayers. Compared to the other Tales of the Slayers books, Volume I is the best. As far as Buffy fiction goes, this was actually pretty interesting and well-written. The problem I had was the sinking realization that every heroine I was introduced to would die horribly by the end of the story. That alone is keeping me from reading the rest of the volumes. Doranna responded to all early injunctions to "put down that book/notebook and go outside to play" by climbing trees to read & write. Such quirkiness of spirit has led to an eclectic publishing journey, spanning genres over 30 novels to include mystery, SF/F, action-romance, paranormal, franchise, and a slew of essays and short stories. Dun Lady's Jess, Doranna's first published fantasy novel, received the 1995 Compton Crook/Stephen Tall award for the best first book in the fantasy, science fiction, and horror genres. When she's not writing, Doranna builds web pages, including this one.